Gallatin, TN – A little help can go a long way – with the impact multiplied many times over. Such is the case with San Diego Contracting Opportunities Center (SDCOC) client GC Green. The firm – which provides energy efficiency and renewable energy construction and consulting services – has not only succeeded, it shares its success with others. GC Green was established in 2010 with its corporate headquarters in a HUBZone on Main Street in downtown Vista, California. Working with the SDCOC (PTAC) from the very beginning, it achieved status as a service disabled veteran-owned, minority-owned and woman-owned business, expanding its opportunities to win federal, state and local government contracts. GC Green’s military heritage combined with its emphasis on sustainability allows the company to take a mission-based approach to its work, while remaining focused on the long term benefits to both public and private sector customers. In addition, their philosophy of supporting the local community is reflected their focus on hiring other veterans, minorities, and women, further contributing to its culture of cultivating others as the company grows itself. One example of GC Green’s collaborative approach to serving a public need is a $565,624.00 contract the company won with the Department of Veterans Affairs (VA) in October of 2017. 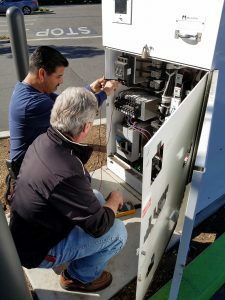 This project was the first in the La Jolla VA’s plan to update its existing chillers to achieve greater comfort for the patients and enhanced energy efficiency for hospital operations. GC Green is teamed on this project with Trane and another service disabled veteran-owned firm, Buescher Electric. Over the years, employees of the company have attended numerous workshops and have worked one-on-one with PTAC counselors on a range of topics including teaming agreements, subcontracting, prevailing wages, capabilities statements, and proposal preparation, among others. Rick Halperin, Director of Corporate Development, said, “GC Green appreciates the San Diego Contracting Opportunities Center for its programs and for being an essential partner for our company to become a better government sector vendor and a more successful business.” Not only does GC Green intend to continue utilizing SDCOC’s services, it encourages its teaming partners and subcontractors to take advantage of the free technical assistance provided by the Center. On Wednesday, September 26, 2018, National PTAC Day activities across the country will celebrate successful PTAC clients like GC Green – as well as the dedicated PTAC professionals like those at the SDCOC.